With Tiger Woods back in the news this week, my thoughts immediately turned to Fuzzy Zoeller’s yakity yak urging Woods not to “order fried chicken or collard greens…or whatever the hell they serve” at the 1997 Masters golf tournament champions dinner. Zoeller might have been one of golf’s most notable players, but he obviously missed the memo on African American culinary tradition. For generations, African American cooks living outside of the South have enjoyed confident, creative culinary expression, preferring to be known for their artistry, rather than the narrow outlook that limits the African American cook’s repertoire to the poverty ingredients and methods of plantation cabin cookery. In 1910, while the domestic scientists were analyzing their food, “draining it of taste and texture, packaging it, and decorating it” to accommodate their shifting emphasis to domestic efficiency, Bertha Turner, a State Superintendent of Domestic Science and private caterer published a remarkable cookbook to preserve black culinary identity. The Federation Cookbook: A Collection of Tested Recipes Compiled by the Colored Women of the State of California, assembled delicious recipes from the noted cooks living in and around Pasadena. The book exemplified a type of culinary professional who survived blatant discrimination and achieved fame and success. By coincidence or Divine Order, Turner’s kitchen priorities and caterer’s virtues of uniformity, familiarity, and predictability perfectly aligned with the domestic science movement’s institutional ambitions of standardization and technical know-how. She was also a very good cook, according to the obituary published in a 1938 local newspaper, which also carried this photo of her, dressed elegantly and draped in fur. She lived prosperously, flourishing in the rich ethnic culture of the Pasadena foothills, and didn’t appear stifled by the Jim Crow ideology strangling her race elsewhere. In fact, her Federation Cookbook set off confidently – perhaps because it epitomized a resolute gathering of out-going, successful women dedicated to social uplift. Unlike Abby Fisher and Malinda Russell who began their books apologetically, Turner gracefully promised in her Preface to deliver “tested cooking of tried proportions, kindly given by our women.” She boldly suggested that readers purchase the book to thank those “helpful, trusty” women whom she memorialized in every recipe. Turner probably was obviously a compassionate woman, too. The Federation Cookbook began with a cheerful poem composed by a member of the National Association of Colored Women’s Clubs, to shore up young cooks. She shared more than 200 recipes for simple, as well as elegant cookery, including numerous ways with lettuce, gelatin, and molds – the “dainty” delights popular among domestic goddesses at the time. Interestingly, the only Southern dishes to survive the trip West with this regal, Kentucky-born patron were croquettes, okra, and cornbread. Does that answer your question about what we serve, Mr. Zoeller? 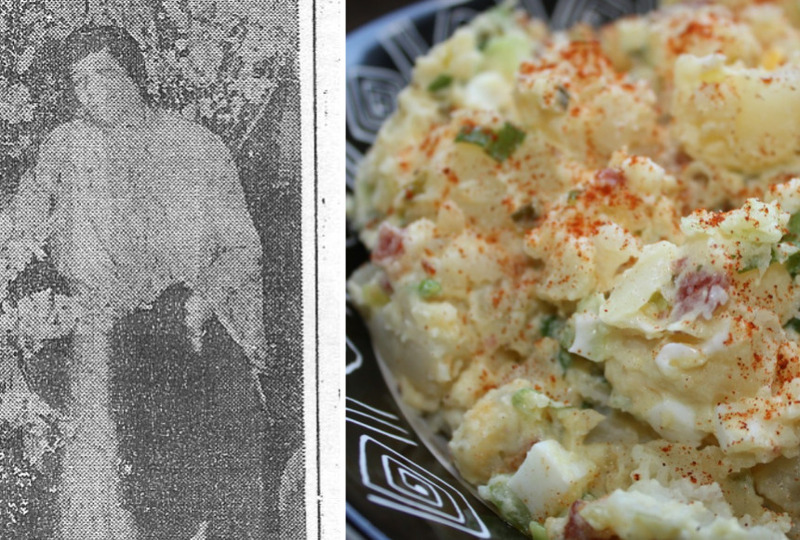 In Bertha Turner’s day, homemade salad dressings, including mayonnaise were evidence of a cook’s proficiency. The mix is simple: eggs, good quality oil, vinegar or lemon juice, and salt and pepper to taste. With today’s rush through the kitchen, you can achieve potato salad with the same creamy results using commercial mayo and a splash of prepared mustard. Cook bacon in a hot skillet over medium heat until crisp. Cool and crumble. Set aside. Scrub the potatoes and boil in their jackets until just done. Cool, peel and dice. Place in a large bowl with eggs, onions, celery, and pickle relish. Stir in mayonnaise and mustard, and season to taste with salt and pepper. Sprinkle with paprika before serving.